The tower we stayed in was dated, smelled, and was WAY below expectations... Check in was arduous and long. Credits promised on bill were not received, and when we called inquiring about them, front desk staff was RUDE!!! It’s almost too big. You get printed directions to your room and even then it’s not easy. The bed was comfy, nice bathroom. Resort fees and over charging for everything. They have coffee makers but yiu have to buy your coffee. You can go to a $59 motel and get free coffee. I had a refrigerator but you cant used because they fill it full of very expensive stuff that you can't afford then charge you for if you touch it. Awesome large room. Very nice accommodating staff and lots of good food! The staff was really helpful. But trying to navigate the casino was really difficult. The room we had was an upgrade thanks to the woman at the front desk but even then it wasn't much of a room, there wasn't even a bathtub. I don't think it was worth the price tag. I will be staying at Treasure Island again instead, that's the casino I'm normally staying at. They would charge you for breathing if they could. Smelled of smoke everywhere, even in nonsmoking room. Not warm experience, everything was an excessive charge. They would charge you for breathing if they could. Not warm, felt nickeled and dimed constantly. Rooms were ok, pools were ok. No hot tub, no chairs available at pools. Liked the property but didn't like to be nickel and diming as it came to the in the room amenities. For paying a room rate of what we paid to have to pay for in-room coffee was not right. For preference needed for hotel guests as it related to the night club on property. Massive line of people trying to get in and not worth it. Located in Las Vegas Strip, Caesars Palace - Resort & Casino is adjacent to LINQ Promenade and within a 10-minute walk of other popular attractions like High Roller. This 4391-room, 4.5-star resort has 7 outdoor pools along with a full-service spa and a casino. There are ample dining options with 16 onsite restaurants, including G. Ramsay Hells Kitchen, which specializes in American cuisine. Savor a meal from the comfort of your room with 24-hour room service, or get a quick energy boost at the 4 coffee shops/cafés. Cooked-to-order breakfast is offered for a fee each morning from 7:00 AM to 11:00 AM. Guests can expect to find free WiFi and a TV with pay movies. The bathroom offers hair dryers and free toiletries. Other standard amenities include free local calls, a laptop-compatible safe, and an ironing board. 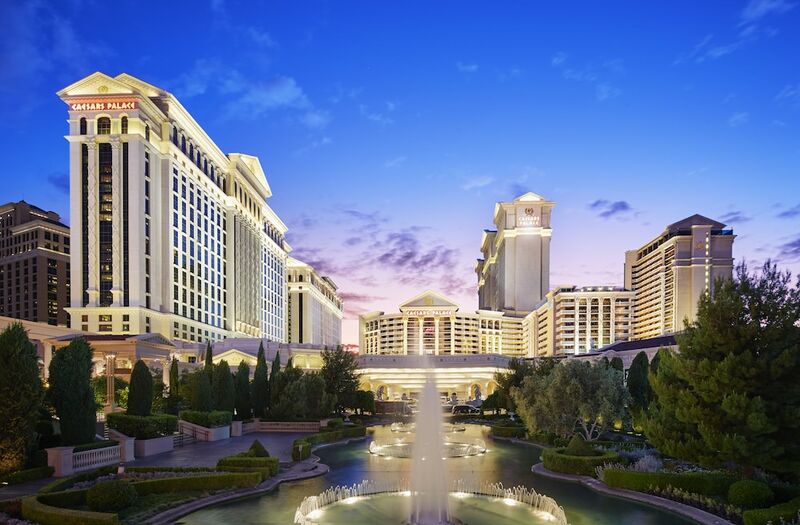 Caesars Palace - Resort & Casino features a full-service spa, 7 outdoor pools, and a casino. Parking is available for USD 15 per day (USD 28 per day for valet parking), and there's also limo/town car service. The 24-hour front desk has multilingual staff ready to assist with dry cleaning/laundry, concierge services, and securing valuables. Other amenities at this luxury resort include a nightclub, a fitness center, and a spa tub. Cooked-to-order breakfast is served daily from 7:00 AM to 11:00 AM for a fee. G. Ramsay Hells Kitchen - Restaurant and bar specializing in American cuisine. Open daily for lunch and dinner. Nobu - Fine-dining restaurant with onsite bar. Reservations required. Pronto by Giada - Bistro with onsite bar. Bacchanal Buffet - Buffet restaurant. Mr. Chow - Fine-dining restaurant and bar with pool and garden views. The resort has 7 outdoor swimming pools and a seasonal outdoor pool. A spa tub, a sauna, and a fitness center are other recreation options.